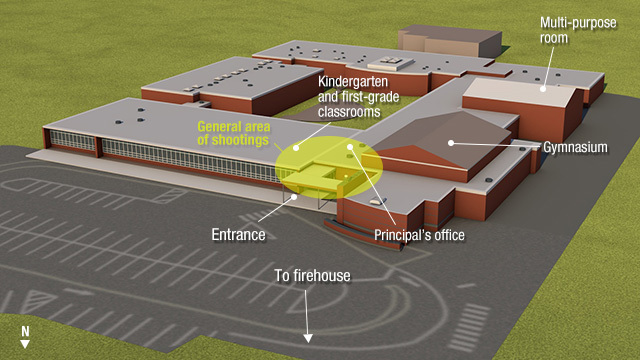 Sandy Hook Elementary shooting: What happened? Sandy Hook shooting: What happened? At some point before he went to the school, investigators believe Adam Lanza, 20, killed his mother, Nancy Lanza. He grabbed three guns from the house -- a semi-automatic AR-15 assault rifle made by Bushmaster and pistols made by Glock and Sig Sauer -- and went to the elementary school wearing black fatigues and a military vest, according to a law enforcement official. The above weapons are similar to the ones found with the suspect: A Bushmaster rifle, a Glock handgun, and a Sig-Sauer handgun. Classes were under way at the school. Approximately 700 students were present. Earlier this year, the school principal, Dawn Lafferty Hochsprung, ordered a new security system installed that required visitors to be visibly identified and buzzed in. As part of the security system, the school locked its doors each day at 9:30 a.m. The door was locked when the gunman arrived. Authorities now know the gunman used "an assault weapon" to "literally (shoot) an entrance into the building," Connecticut Gov. Dannel Malloy said. Hochsprung heard loud pops. She, school psychologist Mary Sherlach and vice principal Natalie Hammond went out to investigate. Only Hammond returned from the hallway alive. She was wounded. At about 9:30 a.m., as announcements were read over the loudspeaker to the students, shots were heard across the school. Students described being ushered into bathrooms and closets by teachers after hearing the first shots. Lanza moved toward two classrooms of kindergartners and first-graders, police said. In one classroom was Lauren Rousseau, a substitute teacher who was filling in for a teacher out on maternity leave. The gunman shot all 14 students in the classroom, law enforcement officers said. In another classroom, Victoria Soto, 27, moved her first-grade students away from the door. The gunman burst in and shot her, according to the father of a surviving student. Six students were killed in that classroom. At the police station, dispatchers began to take calls from inside the school. Authorities say the first emergency call about the shooting came in at "approximately" 9:30 a.m.
"Sandy Hook school. Caller is indicating she thinks someone is shooting in the building," a dispatcher told fire and medical personnel, according to 911 tapes. The first officer arrived on the scene of the Sandy Hook school shooting two minutes and 41 seconds after the first police radio broadcast of the shooting. Previous CNN reporting cited an incorrect arrival time based on early reports. Police report that no law enforcement officers discharged their weapons at any point. The gunman took his own life, police said. He took out a handgun and shot himself in a classroom as law enforcement officers approached, officials said. Twenty students, ages 6 and 7, and six adults were killed at the school. Police secured the building, ensuring no other shooters were on site. Police then escorted students and faculty out of the building to a nearby firehouse. As reports of the shooting made their way around town, frantic parents descended on the firehouse where the children had been taken. By nightfall, the firehouse became a gathering point for parents and family members whose loved ones would never walk out of the school.